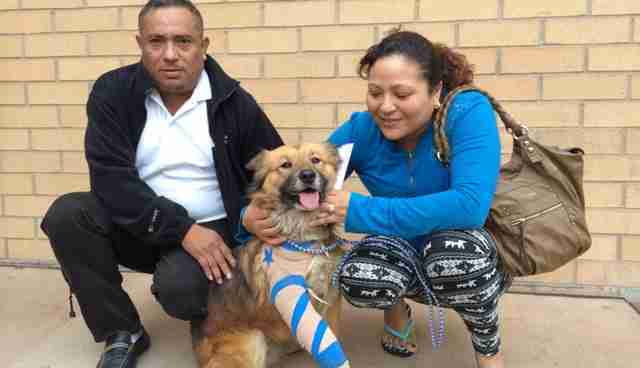 Late last month, a heroic dog named Charlie was shot twice while defending her family from an intruder that entered their home in Los Angeles -- saving the lives of children who were standing in the line of fire. Sadly, as they were unable to afford medical care for their pet, the family reluctantly surrendered her to police and she was taken to a local animal shelter. "If Charlie had not taken the bullet, it would have hit one of my children," says the dog's owner. After learning that surgery to correct gunshot wounds in her front and rear legs would cost $3,000, the North Central Shelter Intervention Program launched an online crowdfunding campaign to enlist the public's help in funding the expensive procedure. "If we can raise the money for Charlie's surgery, she can be reunited with the family she loves so much that she risked her life to save them," the shelter wrote. "Her front right leg has a compound fracture low on the humerus that requires a complicated surgery or possible amputation. 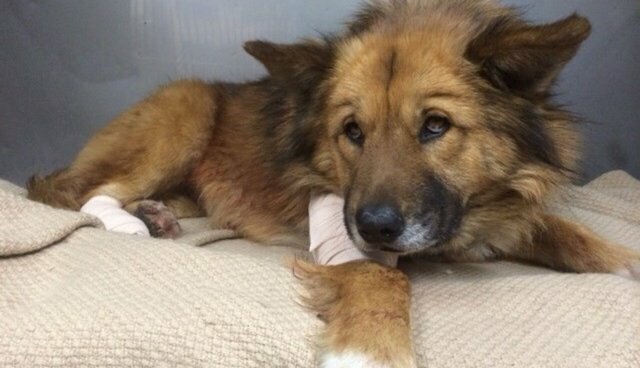 Her back right leg has a deep laceration that needs treatment." Soon Charlie's story began to spread. After the Bill Foundation, an LA-based dog rescue group, posted the dog's story on Facebook, donations began to pour in -- receiving more than $4,000 dollars in less than an hour. Thanks to the help of countless strangers who pitched in their support, Charlie fianlly got the treatment she needed, though sadly that meant losing her injured legs. But most importantly, she was able to return home to the family she risked her life defending. "Charlie's owner told us that once Charlie got home and saw the children she got up and started walking," says the shelter. "Thank you all for your support!!"